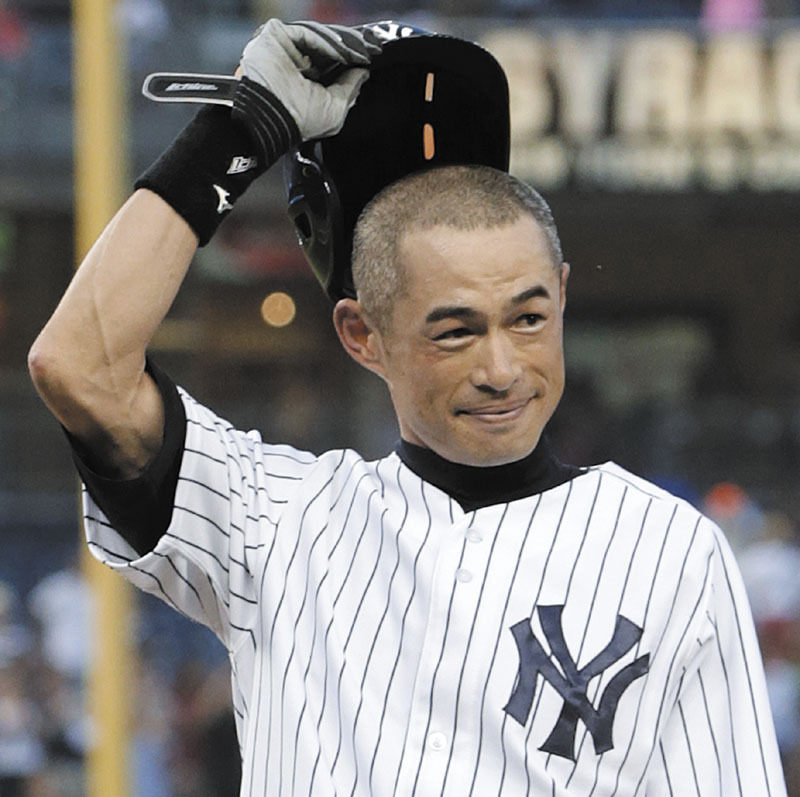 NEW YORK — Ichiro Suzuki stood near first base after lining a single for his 4,000th hit, hugging his teammates one by one, basking in the resounding cheers of an adoring Yankee Stadium crowd. In that moment it did not matter that his name would not be listed in Major League Baseball’s record book next to Ty Cobb and Pete Rose, the only two players to reach the milestone solely in the major leagues. Everyone involved Wednesday night knew: this was quite an achievement. “I was overwhelmed,” Suzuki said of the reception. The 39-year-old outfielder slashed a single the opposite way in the first inning off Toronto knuckleballer R.A. Dickey that bounced just beyond diving third baseman Brett Lawrie for hit No. 4,000 in a career split between Japan and the major leagues. With his 2,722nd hit in the big leagues he passed Yankees Hall of Famer Lou Gehrig in his 13th season in the United States. The speedy outfielder amassed 1,278 hits in nine seasons with Orix of Japan’s Pacific League. Rose finished with 4,256 hits and Cobb had 4,191, but Suzuki is not thinking about catching Rose. MLB does not recognize Suzuki’s overall mark, but players and coaches around the league marvel at the rarely heard number. Suzuki was surprised when his teammates streamed out of the dugout and surrounded him at first base, Curtis Granderson giving him the first hug. Suzuki said he felt bad that the game was being stopped for him and he tried to prevent the Yankees from coming onto the field, but he was grateful. The broad grin that broke out when he saw his team said it all. Suzuki acknowledged the fans by doffing his helmet and bowing several times, the final one toward the Blue Jays’ dugout. When he went to his position in right field for the second inning, Suzuki tipped his cap to the fans who greeted him with a standing ovation. Ken Griffey Jr., a former teammate with the Seattle Mariners, congratulated Suzuki with a message shown on the video board at Yankee Stadium. Suzuki’s postgame news conference with the Japanese media lasted a whopping 47 minutes. A .353 hitter in Japan in a career that began in 1992, Suzuki became the first Japanese-born non-pitcher to sign with a major league team. He smoothly made the move from Orix to the Mariners in 2001 when he was 27. He was selected AL Rookie of the Year and MVP in his first season, when he batted .350, had 242 hits and stole 56 bases. Suzuki had at least 206 hits in each of his first 10 years in the majors, peaking in 2004 when he set the record for hits in a season with 262, topping George Sisler’s mark of 257 established in 1920. He has a .320 career average in the majors. According to STATS, Suzuki has the most hits through the first 13 seasons of a big league career. Paul Waner is second with 2,648 hits for Pittsburgh from 1926-38. The slender 10-time All-Star seemingly can place the ball wherever he wants with a slashing swing that makes him look more like an epee-wielding fencer than a professional baseball player. With a fashion sense nearly as unique as his swing, Suzuki often wears skinny jeans cuffed at the bottom to show off a rainbow of shoes and socks. Sporting clothes by his favorite designer, Thom Browne, he looks more like a 20-something than a graying star. Despite his age, Suzuki should have a good shot at the revered major league mark of 3,000 hits. He is signed for one more year with New York at $6.5 million, and the 10-time Gold Glove winner is still an outstanding outfielder. Ever since he was an 18-year-old rookie for Orix who didn’t think he was ready to be called up to the big club, Suzuki’s approach has been one at-bat at a time. And his thought process wasn’t any different when he tried to embrace the idea of 3,000 major league hits, an accepted marker for a Hall of Fame career. AP Sports Writer Jim Armstrong in Tokyo contributed to this report.